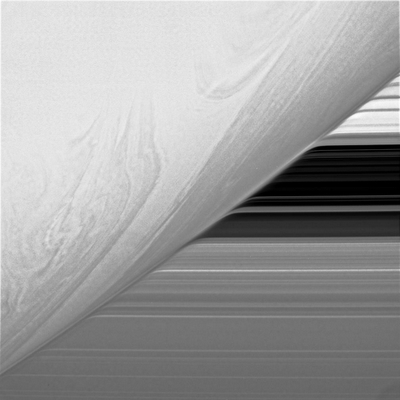 Saturn's swirling clouds - Solar System Planets And Moons Section. Saturn's Bend in the Rings. Saturn's swirling clouds. Image credit: NASA/JPL/SSI. In this image of Saturn, taken by Cassini, it's possible to see how Saturn's atmosphere distorts the rings right next to the planet. This happens because Saturn's atmosphere refracts the light coming from the rings, similar to how object in the water look distorted and out of position.